Dr Larisa Labzin who is working to understand how our body fights back against viruses has received a national medical research award. Larisa won the National Health and Medical Research Council (NHMRC) Frank Fenner Award for being the top-ranked researcher awarded an early-career NHMRC fellowship in 2016. 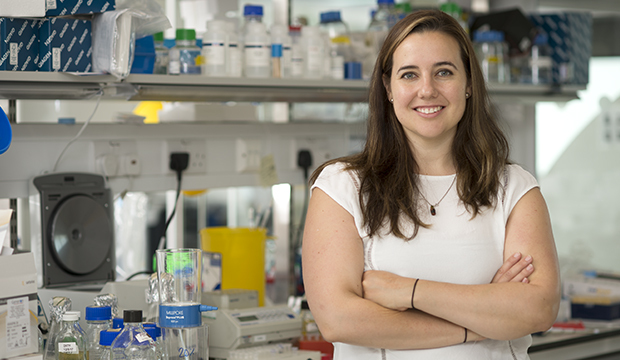 As part of her fellowship, Dr Labzin will spend two years working with Dr Leo James at the MRC Laboratory of Molecular Biology in Cambridge, UK, before returning to Australia to work in Associate Professor Kate Schroder’s Inflammasome Lab at IMB. “Infectious diseases kill more people worldwide each year than cancer, however many current vaccines and therapeutics are only partially effective,” Dr Labzin said. “The challenge of combating infectious diseases is becoming ever more difficult due to the increasing movement of people around the globe. Dr Labzin’s research could lead to improved treatments for common viruses such as respiratory tract infections, and colds, and also some autoimmune diseases like lupus. The award is one of the NHMRC Research Excellence Awards, which were presented at a gala dinner in Canberra on July 12.